Grilled Tuna with Orange Ginger Sauce. I love a good piece of tuna. We don’t eat it very often due to the high prices for fresh fish in our area. Costco is a great resource for fresh fish that doesn’t deplete your savings account. 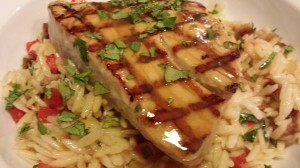 Having found some nice fresh tuna at Costco, I recently prepared my Grilled Tuna with Orange Ginger Sauce and served it over a buttery Date Orzo Pasta Medley. Fresh tuna tastes best when seared on each side and not cooked the whole way through. You may prefer a well-done piece of tuna. I prefer my tuna to be rare inside. You can use another type of fish, perhaps halibut or sea bass, for this dish if you want a more well-done fish. I started out with a marinade for the tuna of seafood stock, minced garlic, freshly squeezed Valencia orange juice, canola oil, honey and a few pieces of peeled and sliced fresh ginger root. 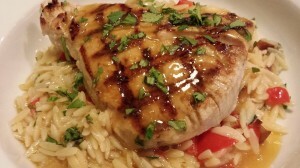 Let the tuna filets marinate for about half an hour in your refrigerator. In the meantime, I cooked some orzo pasta in a pot while I sauteed some diced shallots and red bell pepper in some butter. Added some chopped dates to the shallots and bell pepper saute, then combined the mixture with the cooked and drained orzo pasta. Added some minced cilantro and a bit of butter, stirred, and set aside, covered, to keep warm. Take the marinated tuna out of the fridge. Strain the marinade into a small pan. Simmer and reduce the marinade until it thickens. Stir in some butter and keep warm. Then I grilled the tuna filets in coconut oil over medium heat in a grill pan, sprinkling some salt on each side as I grilled. Sear it for just a few minutes on each side. Plate the orzo pasta medley and put the tuna on top. Spoon the sauce over the tuna. Garnish with cilantro. 1. Put the tuna filets into a Ziploc bag. 2. Whisk together the seafood stock, garlic, orange juice, canola oil, honey and ginger. Add to the Ziploc bag, close the zipper, and move the bag around to coat the tuna filets with the marinade. Let marinate in refrigerator for up to 30 minutes. 3. Cook the orzo in a pan in boiling water according to the package directions. 4. While the orzo is cooking, melt the 2 T butter in a skillet. Saute the shallots until slightly caramelized. Add the red bell pepper and cook 2 minutes more. 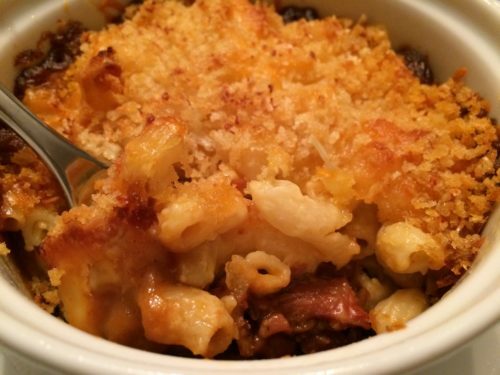 Add the dates and cook another 2 – 4 minutes until warmed through. 5. Drain the orzo and return to its pan. Stir in the shallot, bell pepper, and date mixture. Stir in an additional 1 T butter and the cilantro, cover, and keep warm. 6. Remove the marinated tuna from the refrigerator. Strain the marinade into a small saucepan, discarding the solids. 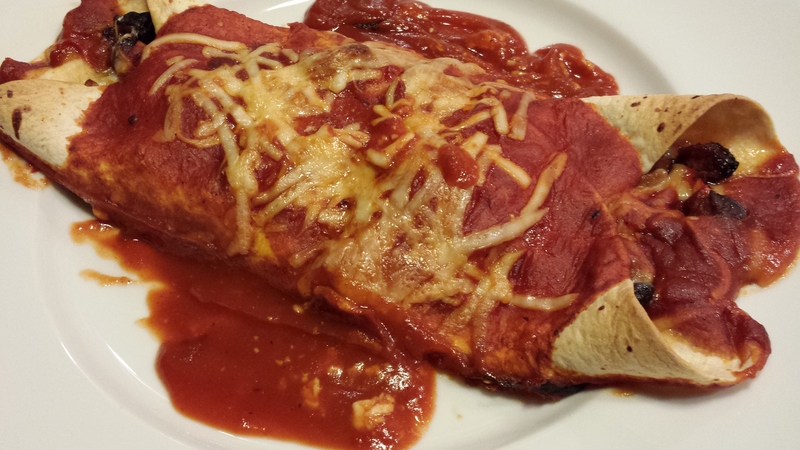 Over medium heat, reduce the sauce until it thickens. Whisk in the remaining 1 T butter to finish the sauce and remove from the heat. Keep warm. 7. Heat a grill pan over medium heat. Add the coconut oil and move the pan around to coat it evenly with the oil. When the oil has warmed, sear the tuna filets on each side for about 1 – 2 minutes per side for rare tuna with some nice grill marks, no more than 3 minutes per side. Sprinkle a bit of salt on each side while searing. Do not overcook a good piece of tuna. 8. While the tuna is searing, prepare the serving plates. Divide the orzo mixture between the two plates. 9. When the tuna is seared on both sides, and done to your liking, place the tuna filets over the orzo pasta medley. 10. Top the tuna with the reduced marinade sauce and garnish with cilantro. Serves 2 as a main course. Offer with a mixed green salad, perhaps with some fresh mango or pineapple chunks and a sprinkling of goat cheese crumbles dressed with my Lemon Thyme Vinaigrette. 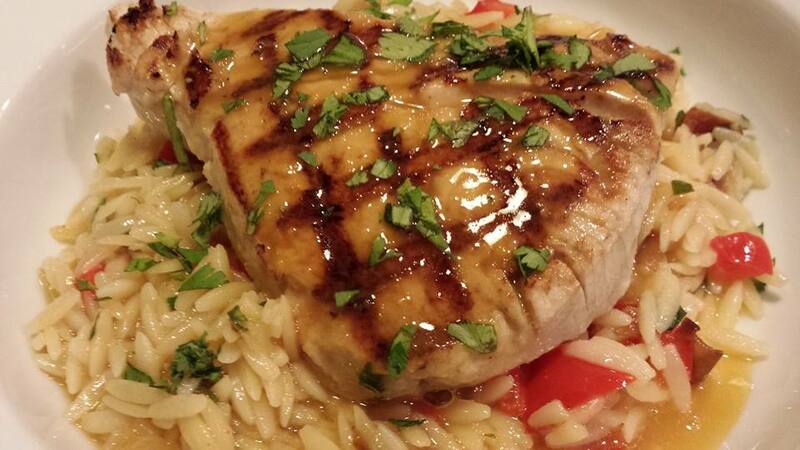 Variations: Serve the grilled tuna and orange ginger sauce over mashed sweet potatoes instead of the orzo medley. Use a white fish such as halibut if you prefer to consume a fully-cooked piece of fish. Use parsley if you are not a fan of cilantro. Substitute canola oil for the coconut oil.